As a songwriter, there are many ways in which I stump myself and block my own creative path. It is unintentional, of course, but nevertheless very frustrating. Being set in a way that a song “should be about X” or that “this melody is the one I want” can keep an idea from really blossoming. That was not the case with the “Freefall” EP with Au5. 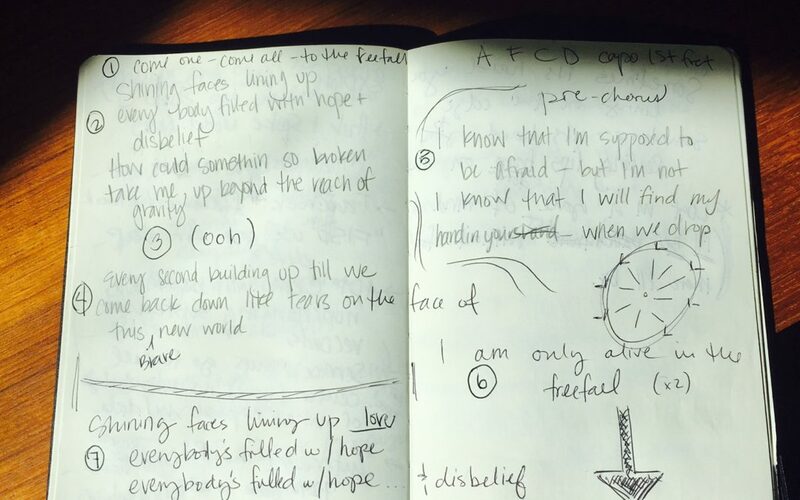 When Austin sent me a folder of unfinished work, three songs immediately jumped out at me. When something is a natural fit, the idea comes almost instantly. My sleeping mind awakes and the music pours out. That isn’t to say that after an idea emerges my waking mind doesn’t question it – because insecurity definitely happens too! However, in this instance, Austin was able to take my pure, instinctual output and make it work beautifully with his music. The music to “Freefall” seemed like a mischievous night out with my friends… an eccentric circus with otherworldly characters. His chord progressions gave me the feeling of a story with a great twist. I closed my eyes and put words to that story without really thinking. “Shock Diamond” continued that journey into the next day and night; riding bikes with my love through parks, the city, and into a full moon. Something about being on a bicycle, with the wind in your face, opens up a child-like innocence and sense of play. Austin originally named the song “Shock Diamond” and we decided to keep it because basically “why not?” 🙂 Lastly, “Emergence” was a forum for Austin to have fun with his unique sound. I wanted to provide a riff that he could take, experiment with and push his own limits. It all fit together as a strong finish to the EP. The remixes have been the “cherry on top” for this whole experience. For the process to happen so seamlessly from inception to remix is very rare. Nothing blocked our creative path this time, and it will be something I look back on and remember with pride and joy.